This recipe works equally well with chicken fillets however allow one fillet per person, you could use streaky bacon as an alternative to smoked bacon. Heat the butter in a pan and add the onion, mushrooms and herbs, cook for 2-3 minutes until the onion has softened and translucent. In a separate bowl mix together the breadcrumbs, pork meat, chestnuts and cranberries then add the cooked onions and herbs. 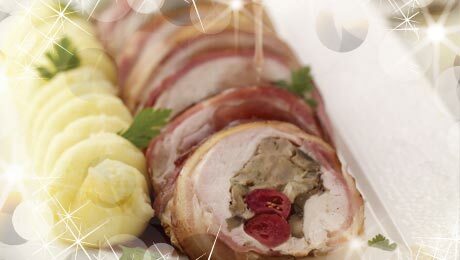 Lay the turkey escalopes on a board and spoon some stuffing onto each, then roll into a cylinder and wrap with some smoked bacon. Heat some oil on a non stick frying pan and seal the turkey on all sides. Transfer to a baking dish and place into a preheated oven for 30 minutes. Remove from the oven and cover with foil and allow to rest for 10 minutes before carving.